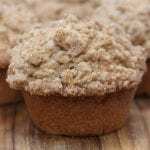 Bakery style muffins that will fill your house with the sweet smell of cinnamon and spices. Preheat oven to 425 ℉ and place rack in middle position. For the Apples- Peel and cut apples into small chunks-add to small bowl. Measure sugar, cinnamon and flour. Add to apples, stir well to cover all chunks. Set aside. For the Wet Ingredients- In a large bowl, whisk eggs with all wet ingredients. Set aside. For the Crumble Topping- Mix sugars, flour and cinnamon together. Melt butter and slowly pour over crumble toppings while stirring. Stir with fork until both large and small chunks form. Set aside. Assembly- Spray 2 12 cup muffin tins with nonstick cooking spray and set aside. Add dry ingredients to wet and stir until just incorporated. Be careful to not over stir. There will still be lumps. Add apples and stir until just incorporated. With a small measuring cup or ice cream scoop, fill muffin cups to just above 3/4 full. Using a tablespoon, spoon crumb topping over batter dividing evenly. Bake at 425℉ for 5 mins. Reduce temperature to 375℉ and bake for 18 to 22 mins or until golden brown and toothpick comes out with just a few crumbs. Let cool for 5 mins. Remove from muffin tins and let cool on wire rack. Enjoy while still warm and then store in an air tight container. 2 cups diced apples will produce a taller muffin but be sure to not over bake as the muffins will be over dry. 2 1/2-3 cups of diced apples will produce a muffin with a classic 'muffin top'.